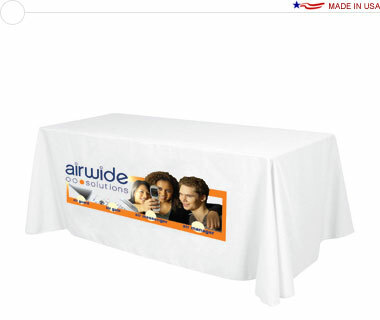 An economy, white table throw dye-sub printed in full color on the front with your submitted artwork. 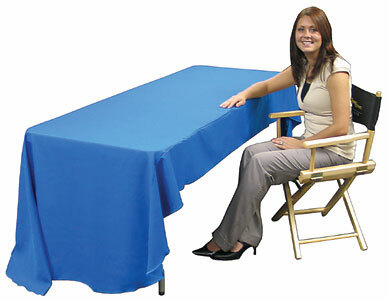 Covers three sides of a 6′ wide, 30″ tall table, with a 9½″ overhang (see photo). The material is a machine washable, wrinkle resistant, flame retardant, premium polyester poplin fabric. Made to fit a 6′ wide, 30″ tall table covering 3 sides with a 9½″ overhang in the back. Recommended for indoor use only. Machine wash on gentle cycle using mild detergent (Woolite®). Do not bleach. Tumble dry on low heat setting only. Do not iron. Do not dry clean. Ships from Ramsey, MN. Minnesota residents subject to state sales tax. Lead time indicates production days and does not include time in transit. Rush shipping options are available, call to arrange. Volume pricing available on orders of 2 or more identical prints. Contact for quote.